Explicit Interviews – Tom Waltz – Turtle Power! EDITOR'S NOTE: Tom was in the IDW Conference room during this interview, that's why there is an echo. Jump inside The Pull Bag's latest interview, as we welcome for the first time Mr. Tom Waltz!!!! 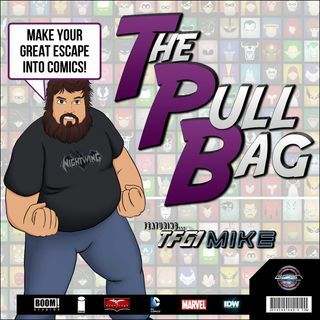 Tom is the writer for IDW's TMNT books, and he's here inside The Pull Bag to talk to Mike and Joe about just how he got into the business of writing comics. Then we also talk about his love for the Turtles, and what it was like getting to craft such an interesting tale for ... See More them! We chat about the 4 year long journey IDW has taken with TMNT, crossovers, and just how it all fits together!! The post Interviews – Tom Waltz – Turtle Power! appeared first on GeekCast Radio Network.